They did it! Today, against all odds, our partner group in Louisiana, Voice of the Experienced, got their rights-restoration bill passed in the Louisiana State Senate. Now, after a brief reconciliation process, it is expected to go to the governor’s desk for a signature. All along, this seemed like an unlikely, uphill battle. Passing it out of the House of Representatives took three different votes this session — and the bill failed in years past. But this is part of the vision and resilience of the formerly incarcerated leaders at the helm of VOTE, who started envisioning what it would be like to organize and build power while they were confined in prison. Checo Yancy, middle, after passage of HB 265, a bill he helped champion. 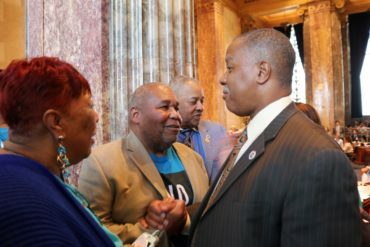 The bill would restore voting rights to people on probation who have not violated its terms and those on parole who have not been incarcerated for the past five years. Stay up to date with Advancement Project’s broader body of work fighting alongside VOTE for the right to vote. Follow updates on our lawsuit, VOTE v. Louisiana and our work in the state.